The purpose of this book is to help us see that we can do better. When routines are busy and demands are urgent, we know that it can be difficult to focus on what is important. In the moment, our desire to breathe deeply and relax is overruled. We believe that we need to control or to fix things. Our habits and reactions contains energy that damages our relationships and limits our opportunities. This energy is bound in our beliefs so we feel that we are right and that it is others who need to change. As pressure builds, we experience stress. We can begin to let go of the energy in our beliefs so that we can find peace and contentment. We can begin to recharge and to reconnect with the important things in our lives. This book describes process, along with helpful tips, to allow you to start using this tool now. 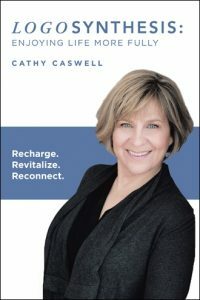 Cathy Caswell is the president of The Healthy Living Plan with a corporate career in marketing and sales. Her leadership at work and in the community has provided rich learning for creating space for success. Cathy grew up in a large, busy family and attributes her drive for results to a mix of genetics and upbringing. She juggles many important roles – mother, wife, coworker, employee, professional, volunteer, community member, friend, and family member. With increased intensity on getting things done, Cathy had a sense that something needed to change. She felt the need to gain control and to fix things. This was requiring a great deal of energy and resulting in reactive behavior. In 2013, she encountered Logosynthesis and began to explore applications. What began as a personal development tool, subsequently lead her to see the potential for leadership and coaching. Her goal is to share this method with individuals and organizations. Building resources and creating space for better working relationships is important for diverse environments undergoing change. Now is the time to learn this tool. Contact Cathy Caswell with questions and to arrange author engagements. Contact The Healthy Living Plan to learn more about programs.